Vice President Joe Biden, who previously revealed the location of his own secret bunker and talked of how shotguns are good weapons because you can shoot through doors at intruders, has now been photographed holding a folder labeled “CLASSIFIED DOCUMENT” for all the world to see. 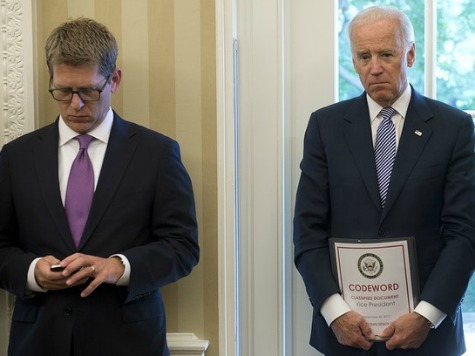 While the details of the folder were not completely visible, a photograph published by AFP/Getty images shows Biden holding the folder backwards–with the label “CODEWORD CLASSIFIED DOCUMENT Vice President September 30 2013” front and center. As The Telegraph reports, Biden has been a gaffe machine since he and Obama won the White House in 2008.